Having fun in my birdbath. I just love watching them after a long day! These Sparrows are having so much fun! 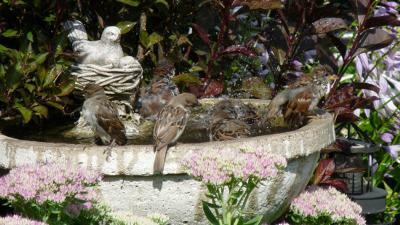 Thank you, Carolyn, for your delightful picture - it is so charming - with the stone bird-bath and stone bird! I just love this picture! It looks so fun to be in that birdbath. Oh my goodness, that is so cute!